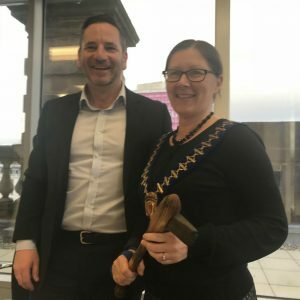 Our own Lee Ann Healy has taken the helm as President of the Scottish Food Trade Association (SFTA). Lee Ann will make use of her expertise in the food and drink sector to help drive the association in its efforts to promote networking and collaboration. Lee Ann and the wider Optimum team have plenty of Food and Drink experience and have kicked off multiple projects in the sector recently with the likes of Loch Fyne Oysters, Kinnerton, Scottish Salmon Company, and Proctor & Associates. Established in 1889, the SFTA is the principal networking organisation for the food industry in Scotland and facilitates a regular exchange of ideas and information between members. A key part of this is its renowned annual dinner, which has a reputation for showcasing the best of Scottish food. Lee Ann’s in-depth knowledge and experience of business change and systems required to support growth and innovation have been welcomed by the SFTA. The Scottish Food and Drink sector is currently booming and the SFTA is well placed to help the industry navigate through the challenges that lay ahead and continue to thrive. The SFTA are now planning networking breakfasts, factory tours and hosting keynote speakers to share their insights. There will be plenty on offer to both existing members of the SFTA as well as newcomers.